Our greatest literary innovator and beloved novelist has reimagined Shakespeare's final, great play of magic and illusion. Entertaining, gripping, emotionally rich and wise, Hag-Seed is an homage to a master, positioned for the fall celebrations of the 400th anniversary of the Bard's death. "It's got a thunderstorm in it. And revenge. Definitely revenge." Or that was the plan. Instead, after an act of unforeseen treachery, Felix is living in exile in a backwoods hovel, haunted by memories of his beloved lost daughter, Miranda. And brewing revenge. After twelve years, revenge finally arrives in the shape of a theatre course at a nearby prison. Here, Felix and his motley crew of inmate actors will put on his Tempest, and snare the traitors who destroyed him. But will it remake Felix as his enemies fall? Margaret Atwood's novel take on Shakespeare's play of enchantment, revenge and second chances leads us on an illusion-ridden journey filled with new surprises and wonders of its own. After finishing the last page of Atwood's brilliant retelling of Shakespeare's The Tempest, my heart hurt so much that I hugged the book to my chest. What a completely delightful, wonderfully intelligent read. I was drawn in slowly by Atwood's story, until suddenly I found myself resentful of anything that forced me to put the book down. Hag-Seed often made me laugh, and once brought me to the brink of tears; I thrilled through the fourth act and it sincerely made me reflect on the need for widespread rehabilitation-focused prison models. In other words, this book has something for everyone, as would any Shakespearean play. Hag-Seed is perfect Shakespeare, and my favourite novel (so far) by Atwood. I loved it. I'm a great fan of Margaret Atwood's work. Her usual skill with language, imagination and wit are display here, but she is too constrained by her purpose: to provide a contemporary retelling of The Tempest. There is too much detail of the production of the play for my liking. Moreover, I find the working of the revenge plot too elaborate and unconvincing. I found it delightful. I frequently laughed and thoroughly enjoyed the many references not only to the Shakespearean play but also to the infighting at Stratford. A tongue in cheek expose of behind the scenes manipulation at the Festival. Loved it! Margaret Atwood has a great time playing with Prospero and the Tempest. I enjoyed the comic tension that builds as the play is produced by the bitter, vengeful protagonist in a prison. I worried that his sanity was slipping away but Alls Well That Ends Well. I highly recommend this book. Atwood's retelling of the Tempest is skillfully constructed and great fun. An embittered former director of a major Shakespeare festival uses a prison theatre program as a vehicle for revenge on those who forced him out. 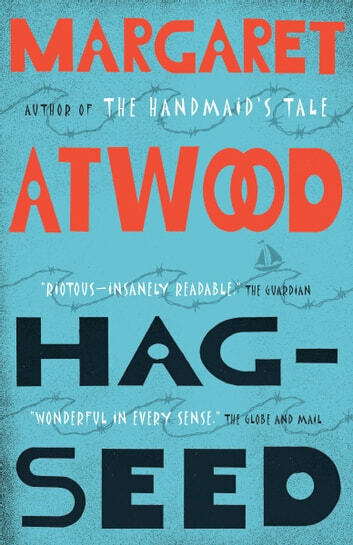 It combines Atwood's trademark sharp observation of human nature and dry humor with a thoughtful take on a familiar story.